Berrima Museum is located in the historic village of Berrima, NSW, mid-way between Sydney and Canberra. The museum is managed and operated by volunteers of Berrima District Historical and Family History Society Inc, founded in 1960. Berrima Museum has been described as one of the best volunteer run museums in New South Wales. Its Mittagong archives contain an extensive collection of the history of the Berrima District, known today as the Wingecarribee Shire. Support material for the museum's displays is sourced from the archives. The museum was established in 1976 following the donation by the Lansley Family of their former home, which was relocated from Moss Vale. Subsequent additions have been made, in keeping with the character of the building. Weekends, Public and School Holidays 10.00am - 4.00pm. Open other times by appointment. Closed Good Friday and Christmas Day. The collection comprises over two thousand items. Highlights include artefacts made by the industrious German Internees at Berrima during WWI, the local cottage hospital and medical equipment, early household utensils and gadgets, ladies' and gents' accessories and clothing, aboriginal artefacts and a collection of photographs. Hillview' at Sutton Forest NSW was the NSW Governer's country residence. 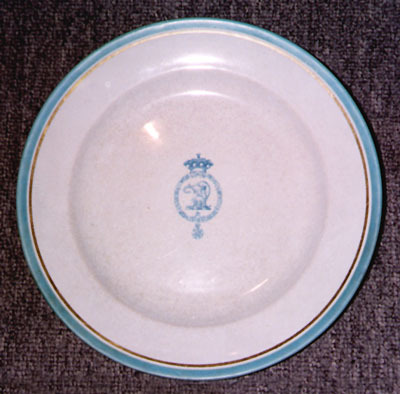 This plate is part of the dinner set used by Lord Carrington at 'Hillview'. It bears his official crest. This boxed bangle is designed as a buckled strap. The metal is enamelled in black and has been engrave with a floral design and decorated with seed pearls. Alice Hopkins was the daughter of George Prowd Lambert, Medical Officer at Berrima Gaol. 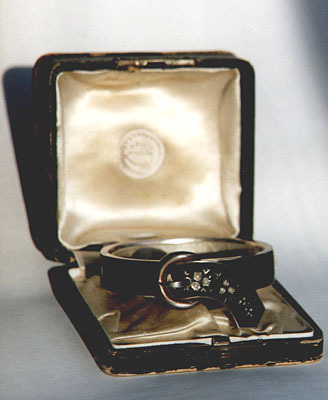 She wore the mourning bangle in memory of her husband Alfred who died, aged thirty six, in a Cobb & Co coach accident at Grenfell NSW in 1891. 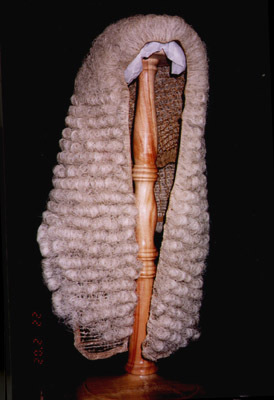 The Hon William McCourt wore this wig in his role as Speaker of the New South Wales Legisative Assembly from 1900 to 1910. A book of his decisions became a reference work of the Assembly. He was a resident fo Berrima and local member in the New South Wales Legisative Assembly from 1882-1885, and 1887-1913. He was Chairman of Committees of the New South Wales Parliament from 1894-1899. This canoe was one of a number built by German internees in Berrima NSW, during World War I. Holding regattas on the river was one of many ways in which they occupied their time. It was discovered in 1978, after being exposed by a flood, in a sandbank in the Wingecarribee River at Berrima. 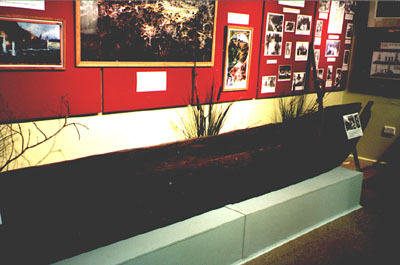 The Stoertebeker is 5.2 metres long, and is the only canoe to have survived. Ernest Edward Powell was born at Berrima NSW on 9 June 1858. He was the third child of James and Jane Powell (nee Henshaw). James Powell came to Australia as a convict in 1834. He was a store-keeper in Berrima. In 1970 Ernest and his brother were left to carry on the business when their family moved to Sydney. Ernest married Annie Hughes and they had four children. He later became a surveyor. He died on 10 September 1943.